Cornell attracts researchers, thinkers, scholars, inventors, scientists, humanitarians, and idea leaders from around the world. A genuine sense of camaraderie—particularly between faculty and students—fosters collaborations and community, while supportive staff help guide students through their life at Cornell. Students develop cross-disciplinary friendships and partnerships that last a lifetime. The Ithaca campus is set on a hill overlooking Cayuga Lake with waterfalls, lakes, botanical gardens, andhistoric buildings. Ithaca is small enough that it’s easy to find your way around and large enough that we have more restaurants per capita than New York City. Cornell has outstanding research and teaching facilities, including new buildings for Life Sciences, Physical Sciences, Engineering, and Art, Architecture, and Planning. These facilities have numerous labs that foster research in nanotechnology, sustainability, energy, creativity, arts, social sciences, and human health. Our philosophy of academic freedom with responsibility helps our students become flexible, collaborative, and innovative thinkers. Our field structure is cross-disciplinary by design and truly unique. We believe that diverse perspectives enhance our community, and the Cornell Graduate School actively recruits,welcomes, and supports students from historically underrepresented groups and students who may be of the first generation in their families to attend college. Many of our nearly 100 graduate fields of study rank in the top 10 nationally. Our programs create innovative pathways to knowledge and understanding in a broad range of research areas. All our programs hone students’ intellectual and creative leadership skills. 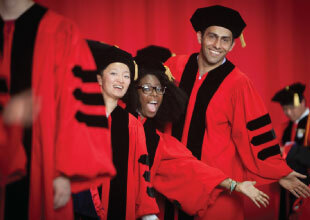 Cornell is one of the top researchinstitutions in the world, with more than $802 million devoted to research spending. In the most recent report, we ranked third in funding from the National Science Foundation (NSF). The Graduate School is committed to supporting graduate education and provides significant funding for the majority of our PhD students.